This week's Make it Monday is to make a shaker card. I don't have any confetti; I have small kids, so I don't really want any in my house, but I did find the crack-your-teeth kind of sprinkles that look just like gumballs! I used my cricut to make the base and lid of the machine out of PTI dp. the background papers are echo park and October Afternoon. The cardbase is PTI rustic cream as is the tag. I think the twine came from Mark's Finest Papers and the tag stamp and sentiment are Unity. The foam came from Walmart, and it was already sticky- yay for that- I don't have a sticker machine! My kids and I are going to make these as Valentines for their teachers. Off to find more hours in the day! ADORABLE!!! 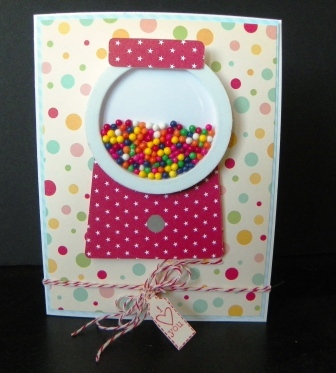 So cute and the sprinkles for gum balls are just the ticket. I don't have confetti around either. This is put together so well Yea for you! This is so cute. I love the little gum balls. Delightful card! Great job on the challenge. The "gum balls " are a perfect choice for a shaker card. love your card:-) try using Google Chrome. I find I have problems with blogger when I use internet explorer but no problems at all with google chrome. It is a free download - hope it helps!! I like "gum balls ". Seu cartão é muito lindo. Parabéns! So cute! Love those sprinkles. Super cute card! I hear you on the small kids and no confetti. LOL :) I have a blog award for you; check it out: http://sparklewithin.blogspot.com/2012/01/liebster-award-passing-it-on.html! Love the theme of yur shaker card. So bright & cheerful. These will make great valentines. Love the twine withthe tag. Such a cute gumball machine, love this idea. Very cute! I love the gumball machine. Great job!